Ok, so, as years go, 2015 was actually pretty good from a writing perspective. Granted, I didn’t accomplish several goals that I set for myself, but I did make significant progress on many goals, and accomplished others that I hadn’t set. 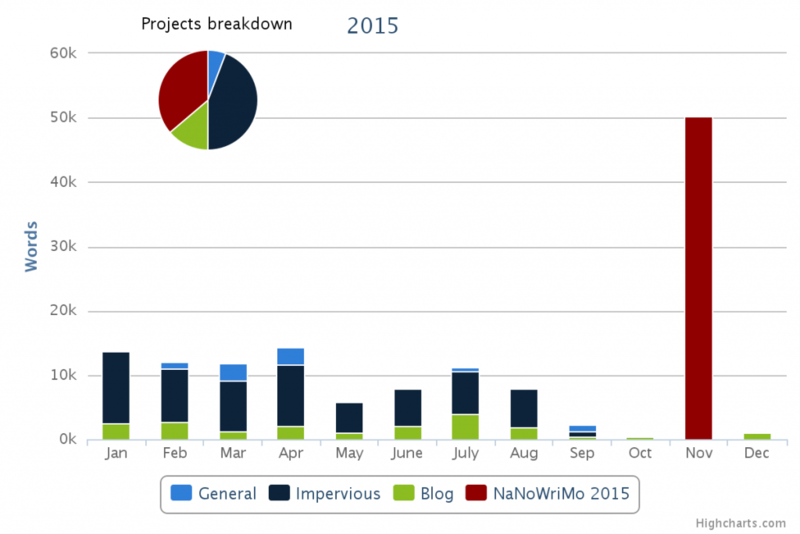 One goal that I did accomplish was writing more in 2015 than I wrote in 2014. I’ve got graphs to prove it too! Still, the title of the blog post has more to do with my love of alliteration than of anything else. Now, onward! In 2014 I wrote a little more than 100,000 words. There are significant periods where I wasn’t writing much, which was primarily due to working on WordKeeperAlpha. In 2015 I wrote around 135,000 words, which, while not the 180,000 I was aiming for, is a significant improvement. This year, too, there were significant dry spells, having to do entirely with buying a house. That was a pretty huge thing. I spent a fair amount of time working on WordKeeperAlpha this year as well. Not too many new features, but mostly because I’m saving them all for one large update in the first half of this year. I’ve made significant changes to the graphing system that will let users choose their own goal graphs and graphs based on projects, too. I’ve also got the beginnings of an API that will let users post their progress on their blogs. I ironed out a lot of bugs over the course of the year. Thanks to all my users who let me know about them when they crop up. I try my best to correct issues you guys have as soon as I hear about them, so please, keep letting me know. We bought a house and moved! It’s completely awesome, and my office is sweet. I got glasses and became that much older. I won NaNoWriMo, which felt good after not completing it last year. I built more IKEA furniture than I knew existed. I replaced a faucet, earning my Homeowner merit badge! Played perhaps too many video games and didn’t read enough books. More stuff I’m forgetting about, because it’s lost in the pre-history of ‘last year’. Well, that’s another year done. 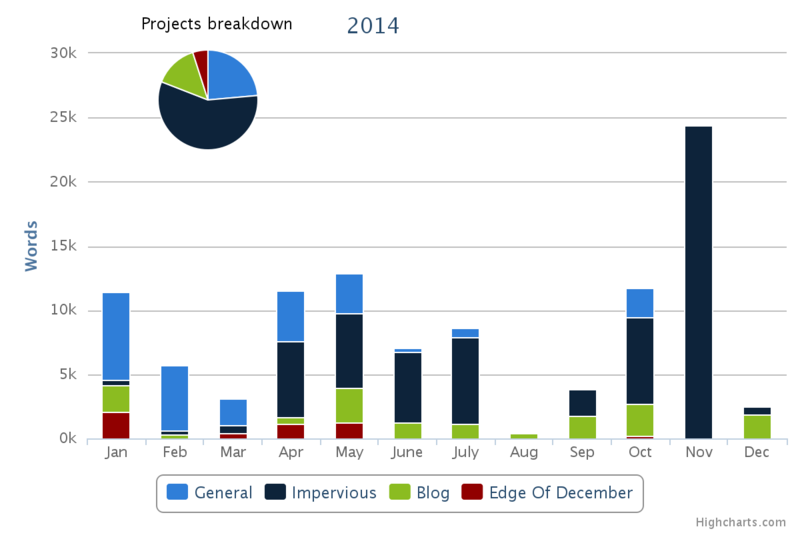 A new one is already under way, but as I said, I’m leaving goals and projects for another blog post. November – December were kind of non-months in terms of blogging, and that means I’m going to overcompensate by stretching out my ‘life-update’ posts as much as possible. That being said, I’m going to check out and try to get a head start on this year’s goals.